A rare number will be seen in the Kaivopuisto Air Show 9.6.2017, a Finland 100 event organized by the Finnish Aviation Museum. The newest pride of Finnair, the Airbus A350 eXtra Wide Body airliner, makes a series of flybys at the Show. Finnair is the first European airline to introduce the new Airbus A350 XWB (eXtra Wide Body) airliner. A350 airliners improve significantly both passenger comfort and energy efficiency. Lightweight composite materials, sophisticated technology and energy efficient engines provide a notable reduction in fuel consumption, compared to other aircraft types of our generation. The first Finnair A350 airliner arrived at the Helsinki Airport in October 2015. Finnair currently has seven aircraft of the type in its fleet, and altogether the company is acquiring 19 A350 airliners. The A350 airliners operate mainly on routes between Europe and Asia. Spectators of the Air Show have a unique opportunity to see the Finnair A350 airliner at close quarters, as Finnair performs a flyby. “Finnair, founded in 1923, is one of the oldest still-operating airlines in the World, and celebrates its own centennial in a few years. The company is the most natural partner to participate in our Finland 100 Air Show, on the parade place of our country”, says mr Markku Kyyrönen, Museum Director of the Finnish Aviation Museum. ”Our Airbus 350 XWB airliners have recieved an excellent welcome from various customers – the aircraft is beautiful, silent, fuel efficient and provides excellent passenger comfort. The aircraft started a new chapter in the history of Finnish aviation. We are glad to participate in a grand Air Show such as this, with an aircraft representing the future of aviation”, says Captain Jari Paajanen, Vice President (Flight Operations) of Finnair. Kaivopuisto hasn’t been chosen by chance as the venue of the Finland 100 Air Show. It has been a traditional venue for air shows already in the 1920’s, with its heyday in the 1950’s. Aero Ltd. (current Finnair) began its operations to Tallinn in March 1924 from the nearby Katajanokka seaplane base, and the Finnish State Aircraft factory was founded in Suomenlinna in 1921. The Event Centre of the Kaivopuisto Air Show is located at Kylpylänaukio, near Café Ursula. There will be plenty of aviation-themed exhibitors at the Event Centre, for the whole family. The Event Centre is open all day, on Friday 9.6. 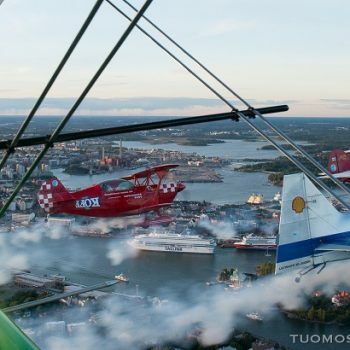 The Kaivopuisto Air Show is a huge, free-of-charge, aviation-themed event, organized by the Finnish Aviation Museum. The Show will be held on Friday Night, 9.6.2017. Various aircraft types representing the past, present and future of Finnish Aviation will take part in the Show. The Show will take place in the air, land and sea. Partners of the event include Finavia, Finnair, Saab AB, SEK, The Finnish Aeronautical Association and the City of Vantaa. The Finnish Aviation Museum is a national special museum, it has the largest aeronautical collection in Finland. Finnish aviation and planes either designed or used by Finns are at the heart of the collection. The Finnish Aviation Museum is an active and interactive Museum up to international standards. The museum is located near the Helsinki-Vantaa airport and can easily be reached by several means of transport. The Finnish Aviation Museum is owned by the Finnish Aviation Museum Foundation.